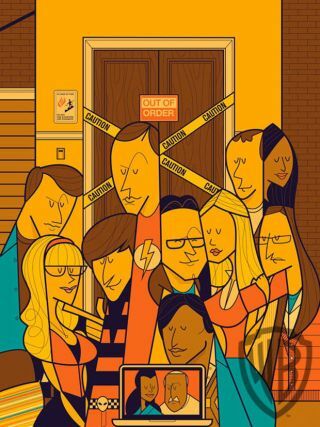 This artwork pays tribute to "The Big Bang Theory" TV show. The Big Bang Geometry, Ale Giorgini, silkscreen, 40"H x 30"W.
A California gallery is paying tribute to the unique brand of nerdy friendship presented by TV's "The Big Bang Theory" in October and November. From Oct. 19 to Nov. 10, the Nucleus gallery in Alhambra, Calif., will showcase more than 50 works of art inspired by "The Big Bang Theory." The art show, called "The Physics of Friendship: A Tribute to 'The Big Bang Theory,'" will feature a variety of professional artists working in many media. This artwork pays tribute to "The Big Bang Theory" TV show. Cog-nition, Steve Simpson, 24"H x 18"W, silkscreen. "The Big Bang Theory" focuses on Leonard and Sheldon — two somewhat socially awkward physicists and roommates. They read comic books, hang out with their scientist friends and try to solve the mysteries of the universe. They do occasionally get into trouble, however. At one point, Howard Wolowitz — one of Sheldon and Leonard's friends — gets a Mars rover stuck in a ditch on the Red Planet when he's trying to impress a date. But that's not where the show's space connection ends. In 2012, NASA astronaut Mike Massimino — the first spaceflyer to send a Twitter update from space — guest starred on the CBS TV show. Massimino played himself on the show and was involved in a plotline that revolved around Wolowitz's plan to travel to the International Space Station. This artwork pays tribute to "The Big Bang Theory" TV show. Space, Boya Sun, 11"H x 8.5"W, watercolor, gouache, & ink transfer. "I think it ['The Big Bang Theory'] does promote science education in some way, because a lot of the shows out there are about other stuff: the office, doctors and lawyers and lots of cop shows," Massimino told SPACE.com last year. "I think this is one of the few shows, maybe the only comedy, that has to do with a science theme. Nucleus will host a free opening night event on Oct. 19 in honor of The Physics of Friendship: A Tribute to "The Big Bang Theory." Admission is free and costumes are encouraged. The event will feature a trivia competition, costume contest, scavenger hunt and other activities. The gallery will also open a pop-up shop with prints and other merchandise available for sale.